Three quality assurance agencies, i.e., National Institution for Academic Degrees and University Evaluation (NIAD-UE) in Japan, Higher Education Evaluation Center of the Ministry of Education (HEEC) in China, and Korean Council for University Education (KCUE) in Korea, jointly conducted second monitoring on the 10 CAMPUS Asia pilot programs in 2015. To conduct the second monitoring, the three quality assurance agencies comparatively analyzed monitoring criteria and methods used in the first monitoring conducted in each country and jointly established a common framework for quality assurance including joint monitoring criteria. At the time of the second monitoring, a Joint Monitoring Committee and Joint Monitoring Panel made up of Japanese, Chinese, and Korean academics and experts with knowledge in the internationalization of higher education and joint programs as well as representatives of quality assurance agencies were established. The Joint Monitoring Committee decided important matters for the monitoring and finalized the joint monitoring report. The Joint Monitoring Panel members carried out document studies of the self-assessment reports submitted by the consortiums, conducted site visits, and produced monitoring reports. The process for the second monitoring is shown in the table below. First, the 10 consortiums were asked to produce self-assessment reports. 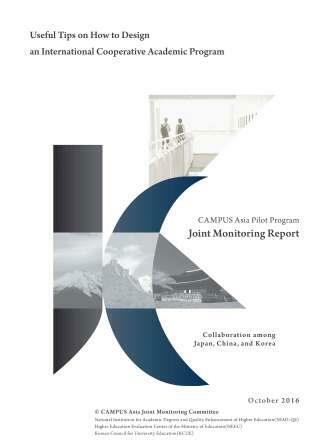 Each consortium was asked to write one self-assessment report in English, with sufficient coordination among the Japanese, Chinese, and Korean universities participating, in light of the joint monitoring criteria. Panel members from the three countries carried out document studies of the self-assessment reports submitted. Following the document studies, Japanese, Chinese, and Korean panel members conducted joint site visits at three of the 10 consortiums (one consortium in each of the three countries). Joint site visits were timed to coincide with events at which representatives from the universities in all three countries would gather together. With respect to the remaining seven consortiums, site visits or interviews were conducted at the universities of each country and the results were shared among the panel members in all three countries. Subsequently, good practices and issues identified in the monitoring of each consortium were collected, and a joint monitoring report was drafted, including the results of the first monitoring conducted separately in each country in 2013. The draft joint monitoring report was ultimately approved and the Japan-China-Korea Joint Monitoring Committee finalized the monitoring results. The joint criteria for the second monitoring consists of five criteria plus ten sub-criteria (two for each criterion), established after comparing and analyzing each country's criteria for the first monitoring and discussing them in the Council. While the first monitoring criteria established by each country were taken as the foundation, for further development, a greater focus was placed on the cooperation among the participating universities and the added-value obtained from cooperative academic programs with foreign universities. -Korea Quality Assurance Initiative for CAMPUS Asia, an overview of good practices in international cooperative programs obtained through the CAMPUS Asia monitoring, and descriptions of good practices by criterion obtained through the CAMPUS Asia monitoring. 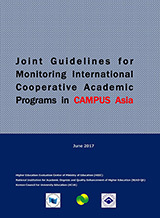 The Joint Guidelines for Monitoring International Cooperative Academic Programs in CAMPUS Asia specify the criteria and methods for quality assurance of international cooperative academic programs based on the experience of trilateral joint monitoring in Japan, China, and Korea conducted on CAMPUS Asia pilot programs in the 2015 academic year. The Guidelines were produced with the hope that they would serve as a helpful model not only for the Japanese, Chinese, and Korean quality assurance agencies conducting this monitoring but also for other quality assurance agencies when conducting monitoring or evaluation of international cooperative academic programs, especially when working with partner agencies in other countries, and for higher education institutions when conducting internal quality assurance of international education.